The second quarter of my 2015 is now fully booked with major running events. The early weekend mornings of Runner Rocky were all alloted for running. Four back-to-back runs completed the month of April. These were the recently concluded Urban Guerilla Race and the DC Comics Superheroes All-Star Fun Run and the upcoming earth runs namely the Pro-Earth Run and the National Geographic (NatGeo) Earth Day Run. Meanwhile for the month of May, as a media partner, I already secured two running events namely the High Miles for Children and the PaRun ng Cowboy Grill. 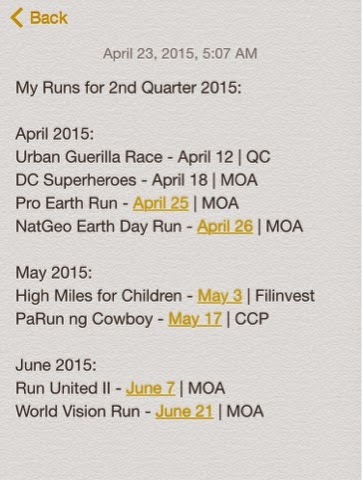 For June, I was already registered for the Run United 2 since I'm targeting to complete the trilogy. Of course, I will surely run for World Vision since this is my anniversary run. This is my very first run last year where I ran 21K for the very first time!